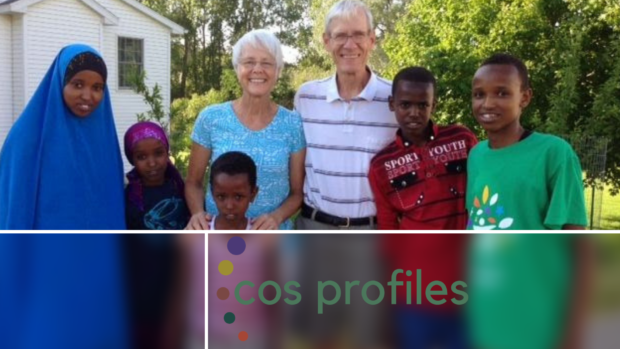 COS Profiles is a monthly newsletter featuring COS members who serve our community in unique and valuable ways, often outside our organized ministries. One such couple is Arvin and Cornelia Vos. 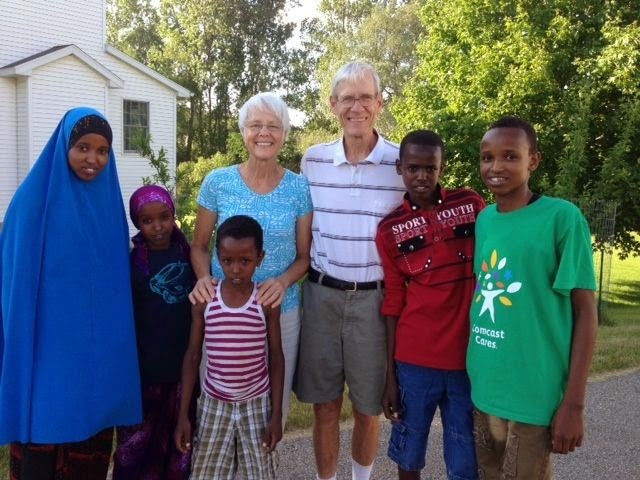 Interviewer: Arvin and Corrie, you recently hosted five children from Somalia. How did they come to stay with you? Corrie: We saw an announcement in the COS bulletin one Sunday that Bethany needed a place for five siblings that could not be separated. The need was urgent – the kids were coming within four weeks. After church, it occurred to us that we had the time and the space. We mentioned it to our adult daughters; they encouraged us and said they would support us. At the beginning, we expected it to be temporary, that by the time school started, the children would be placed in a more permanent home where there were other children. But they stayed with us for almost three years. Interviewer: What were the ages of the kids when they came? Corrie: They were between 7 to 17. We had hosted foster kids before, so we had experience. 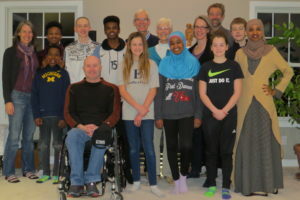 We also had five kids of our own with eight years between the oldest and youngest, so we had teen-aged foster kids even when our kids were little. Over the years we have had about 50 foster kids come through our home. We also had exchange students. Interviewer: Do you have any foster kids now? Corrie: No, we are free now. We can do things like travel. Interviewer: Where are the Somali children now? Arvin: Four of them are in St. Paul, Minnesota with their aunt and her husband. There is a large Somali community there, about 30,000. Their mom is in Kenya with another daughter. She was about to come here but the process stopped with the 2016 election. 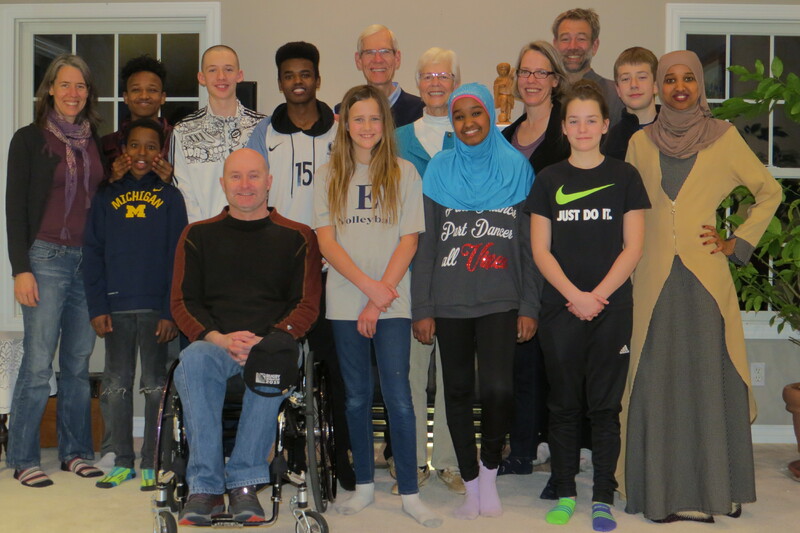 The oldest boy, Abdi, stayed here in GR with our daughter, Jolene, and her husband, Pierre, so that he could graduate from high school. He is doing very well! He is a runner and recently finished second in the state track meet in the 3200-meter event. He has a full-ride tuition scholarship to Michigan State starting this fall. Interviewer: He’s the second child, right? How is the oldest girl doing? Arvin: Well, that’s a nice story, too. Leyla has now completed the program for a certified nursing assistant. She is employing in a nursing home in St. Paul and plans to go back to continue her schooling and work toward becoming a registered nurse. Interviewer: What were their language skills like when they came? Arvin: The oldest two had learned some English in 9th grade in their refugee camp. The younger three knew no English so the older two translated for them. Among themselves, they spoke only Somali. But the younger you are, the easier it is to pick up a language. I remember one time we were talking in the kitchen. The youngest was in the living room playing with Legos. I could hear him repeating everything we were saying, even the intonation. Then after a while, the others began teasing him because he didn’t know Somali as well as they did! They were recently here for their brother’s graduation. Their aunt accompanied them all the way from Minneapolis. It was really nice. They stayed at our house but spent a lot of time with old friends. It’s understandable why, as children here without parents, they would want to go back to a setting that is more familiar, to St. Paul where there are so many Somalis. But Abdi didn’t want to go to Minnesota. He wanted to be more American. Interviewer: You have already sketched some of the joys you experienced with the kids. Can you add anything more? Arvin: Well, it was really nice just watching them develop. It took a lot of our time, often many hours helping the youngest one with homework, reviewing multiplication tables and keeping the older kids from telling the answer! They would have gladly helped. Sometimes he would get frustrated, so we’d send him out to play. He needed the time outdoors. Also, there were other kids in the neighborhood for him to play with. In the winter they used our little hill and would slide out onto the ice. Our grass still hasn’t recovered! Corrie: Of course, it was a huge joy just to be able to provide a home for children who had come from such difficult circumstances. It was also so interesting! We didn’t have to go to Africa. Africa came to us. We found out what kind of foods they liked. Leyla was capable of a fair amount of cooking – in many ways she had managed their house – a hut really – in the refugee camp in Africa. She knew how to cook oatmeal and to make injera and so on. But after I learned how to cook their food, she was content to let me do it. She was in school, so that worked out well. I never did cook injera, but I did cook goat meat. I also cooked them a Dutch dish, nasi goreng, which uses rice and a curry spice, and they really liked that. I made it with chicken. They also learned to eat vegetables here. They said they liked the “green trees” but not the “white trees.” In fact, they learned to like broccoli so much that I had to cook a pan full to have enough. Interviewer: They were Muslims, right? Corrie: Yes, we took them to the mosque, which they wanted. They were in touch with their uncle by phone, so there were adults in the background making sure these children were not becoming apostate. I got a red hajib from Leyla and she showed me how to wrap it. I learned how to go to the mosque, where to enter, where to sit and all that. It gave us experiences that we would never have had otherwise. They went to a different mosque than the Bosnian mosque that COS folks have been connecting with. Interviewer: Along with the joys, there must have been challenges. Corrie: There were many. Let me tell you one story as an illustration. David Bosch had found bicycles for them and they were thrilled. We let them borrow my helmet to go riding before we got them their own. One time, I couldn’t find it. I asked if they might have lost it. Perhaps they set it down by the side of the road and we should go look for it. No, they wouldn’t do that. But they had no idea where it was. Some days later, I was looking for something in our garage and was scanning the shelves and there, on the back of the shelf above the garage door, was my helmet. I was very excited to find it, but when I got it down, it was flat on the top, melted by heat. So, I asked about it. Finally, Abdi told the truth. While we were gone to church, they had come inside to make some tea which involved heating water in a pan with lots of sugar, spices, and a single tea bag. We have a flat top electric stove and Abdi had placed the helmet on the hot burner after he was done, not realizing that it was still hot. He melted the top. They were very frightened and were sure they were about to be beaten. So, we assured them we would never beat them, that this was an accident, and there was no need for them to feel guilty. After that we always had someone stay with them to supervise while we went to church. Interviewer: Well, we should stop. This has been a wonderful story. Thanks very much for sharing it with the congregation. Interviewed by Jim Bradley, June 7, 2018.